I hate to throw out food so I’m always on the lookout for recipes that use up some of my leftover ingredients. We had some heavy cream left over from when we had some fresh raspberries. I also had picked up The King Arthur Flour Cookie Companion cookbook from the library. What an awesome book! 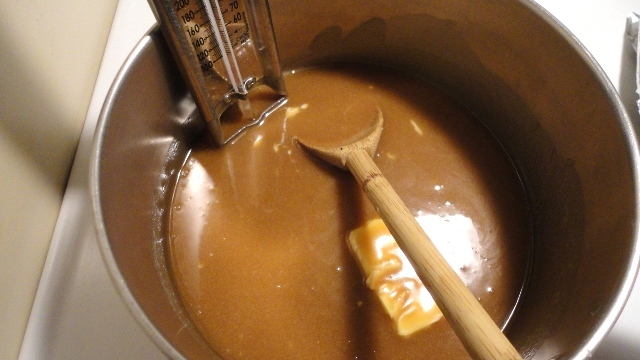 While I was flipping through the book I stumbled upon a recipe for homemade caramel. This was the perfect way to use up my extra cream and my first ever opportunity to use my new candy thermometer purchased months ago. Making candy fascinates me but I’m also a little intimidated by it. Mostly by how precise you must be. I was surprised at how easy this was. Stir all the ingredients together in a 2-quart saucepan. Cook over medium heat, stirring constantly, to the soft-ball stage (230 to 234 degrees). Remove from the heat and pour into a buttered 9 x 13 glass dish. When it’s cool, cut it into squares and enjoy! 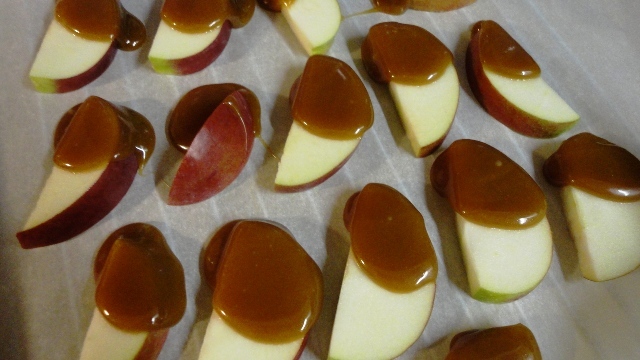 We also dipped some apple slices into the warm caramel for a delicious treat. I am so excited about this cookbook and I promise that I’ll be sharing some more recipes from it. I have about a dozen pages with sticky notes on them to mark the recipes I want to try. 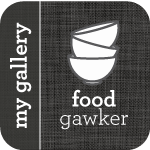 I usually prefer cookbooks with plenty of color photos and this does have a section with photos but most of the book is in black in white. There are many pages with line drawings accompanying the recipes and the instructions and sidebars are so well done and interesting. I’m already planning on keeping this for as long as the library will let me (6 weeks) and I’ve added it to my wishlist for Christmas. 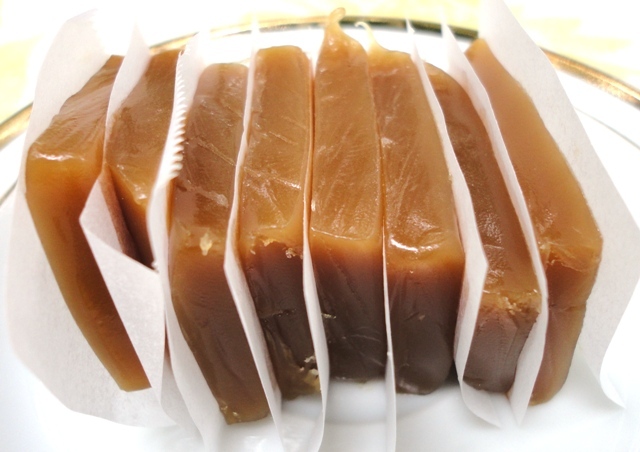 Remove the label from a can of condensed milk, and boil it, unopened, for 2 hours. Add water as needed to keep the can covered. Allow the can to cool to room temperature, then open, stir until smooth and enjoy the heck out of it! This caramel looks awesome, and I bet dipping the apple slices in it when it was still warm was a delicious treat. I actually just made dulche de leche the way the previous commenter is suggesting. 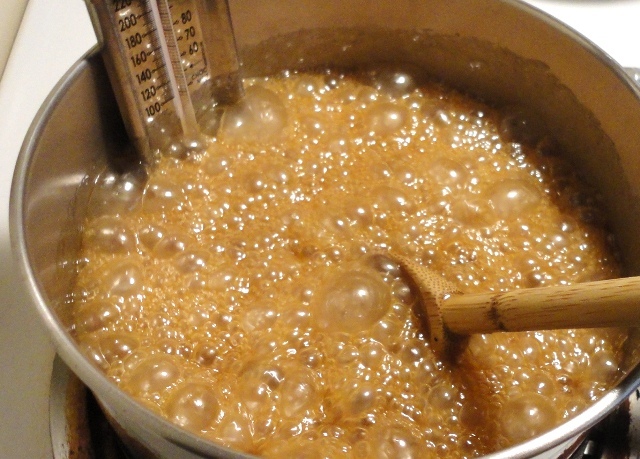 I brought the water to a boil, then lowered the heat and simmered the can for 3 hours and got the most amazing, thick caramel I’ve ever had.